There are many Sunfish Stories in my repertoire. One of the best is one of the earliest. This is my cousin’s little girl, Guliana, sweet as can be. I just love the fact that Famous Seaweed Soup is still a prized read for young readers. Too bad the book is out of print. 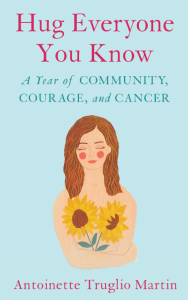 Hug Everyone You Know chronicles my first year battling breast cancer as a wimpy patient. Through journaling and writing emails to my family and friends—My Everyone, I was engaged in life’s stories and somehow, found courage.